We are emerging from a long winter into spring at last. Spring always makes me think of new beginnings. So it seems appropriate that April is Maternal and Child Health Month on the Rotary calendar. This is such an important area of focus for us as Rotarians. We are so blessed to have the resources we have to obtain good healthcare for mothers and children. There are so many areas in our world where this is not the case. When we give to The Rotary Foundation, we are helping to fund projects around this important cause. Please consider making your annual donation to the Foundation soon if you haven’t yet done so. 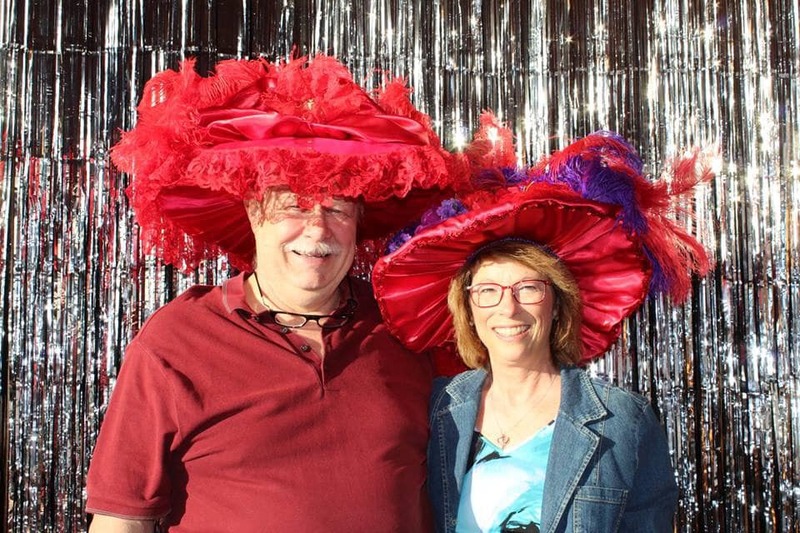 A fun night at Mt Carroll Rotary's Denim and Diamonds fundraiser. 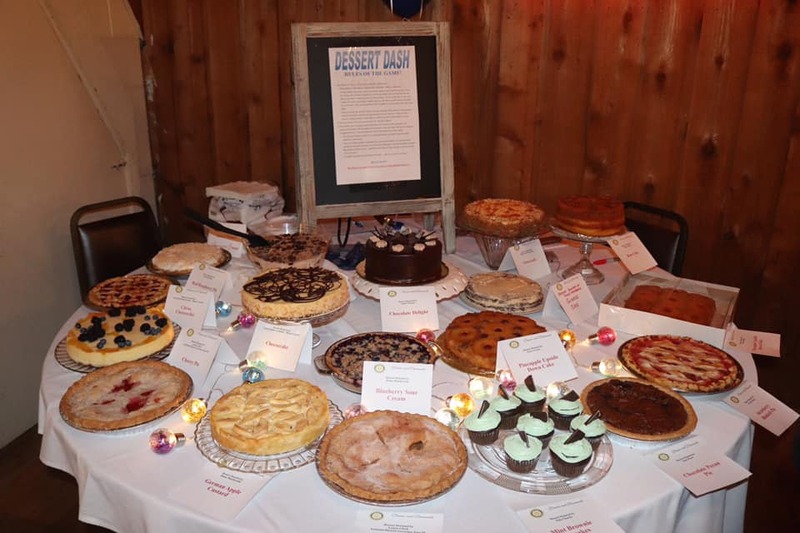 The evening included a buffet dinner, silent auction items, a spirited live auction, and a dessert dash. Kuddos to the entire club for a job well done! 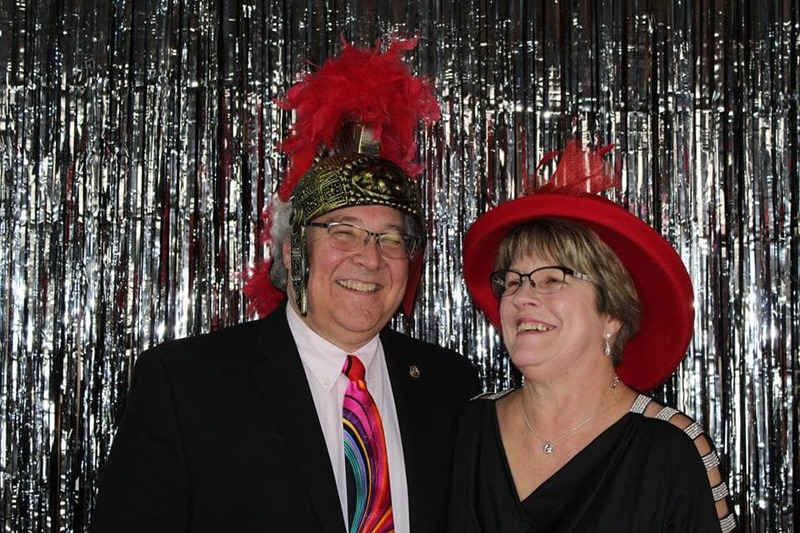 Two Quad Cities Rotary presidents took to 'desperate' measures to raise funds for good causes. 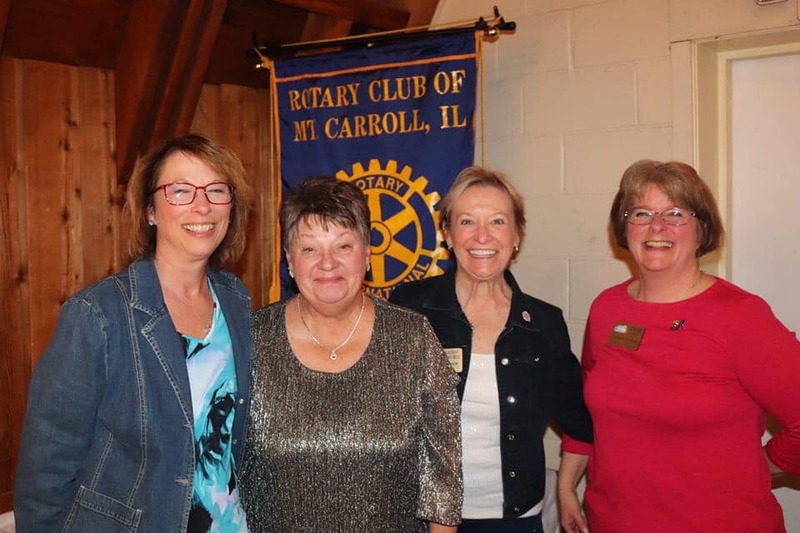 Without prior notice, Rock Island Rotary President Sue Cassatt and Moline Rotary President Kelly Giovanine orchestrated a 'hostile takeover' of each other's Clubs. The Club's president would only regain 'power' if the Club met fundraising goals. 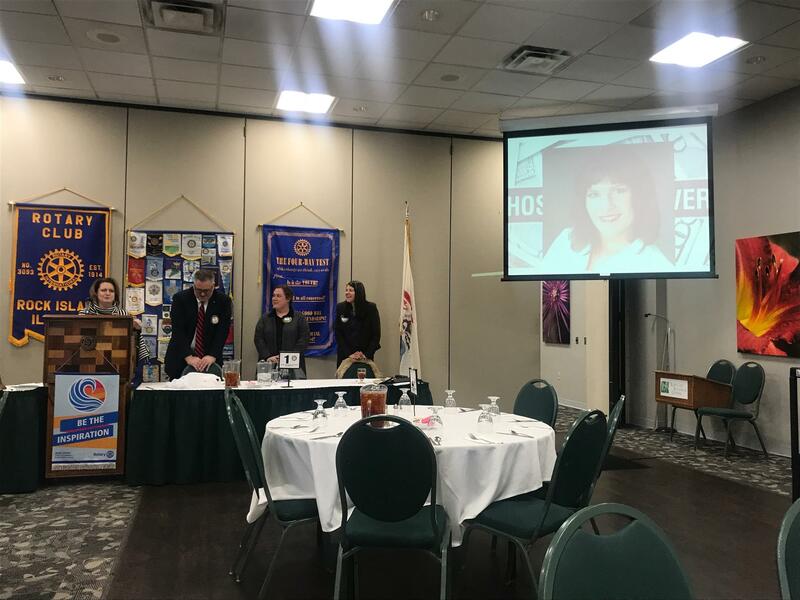 On Monday, February 26, Sue Cassatt surprised Moline Rotary by leading their meeting. 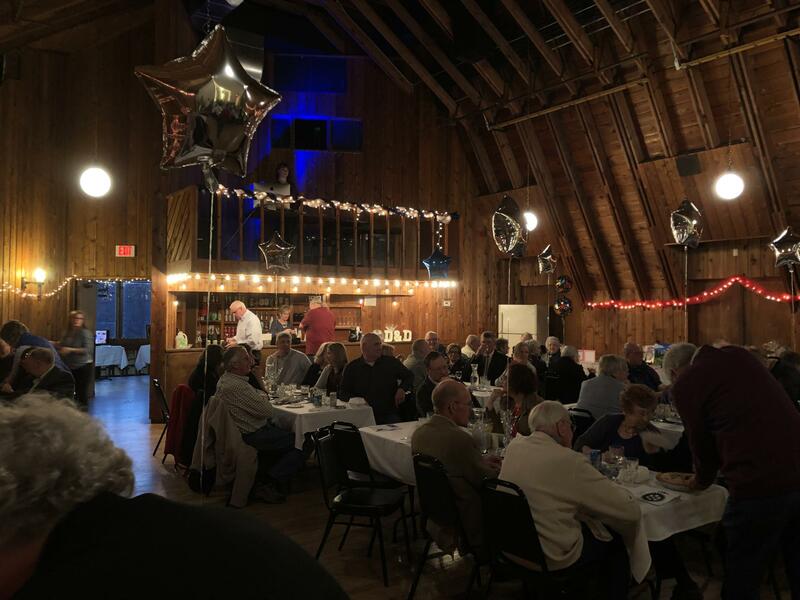 While Club members seemed to have a tough time deciding whether they'd rather pay to get President Kelly back or pay Rock Island to keep her, they managed to raise over $250 for their Literacy Fund. 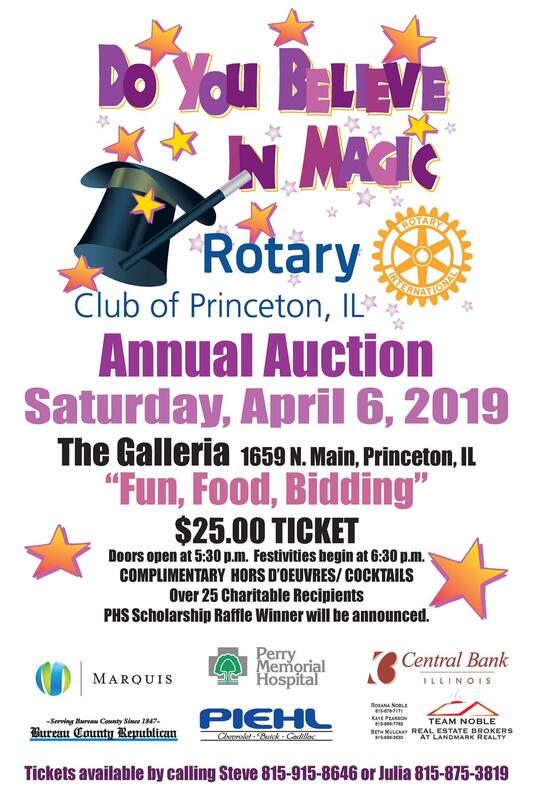 At first lagging behind Moline's donations, Rock Island Rotary refused to be outdone with a challenge and dug deep into their wallets to raise $400 for Rotary's Polio Fund. Pictured is Kelly Giovanine explaining the details of the hostile takeover to a surprised and confused Rock Island Rotary Club Tuesday, February 25. Note President Sue Cassatt is pictured on the monitor. 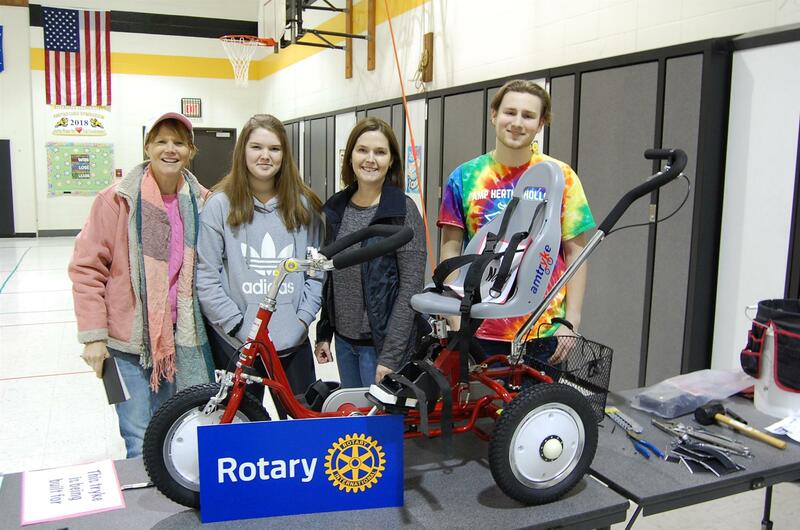 River Cities Rotary teamed up with their local Interact Club to build adaptive tricycles for three special needs students from their area. The club had intended to build just one tricycle, or Tryke, with the help from the Rotary Foundation grant funds. However, due to an overwhelming response from members, the club ended up sponsoring a total of three Trykes. The club had no difficulty with recruiting volunteers, with many Rotary family members coming to join in the efforts. 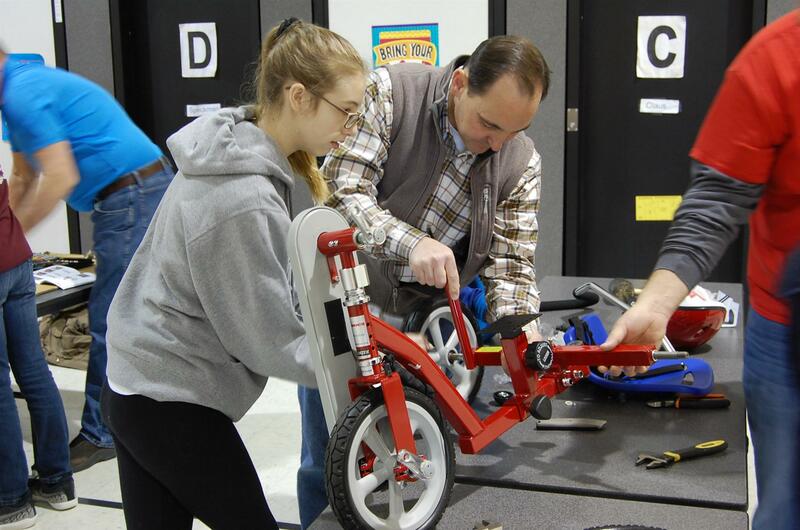 The special customized Trykes were purchased through Mississippi Bend Trykes, a non-profit organization that serves children and families in eleven counties in Illinois and Iowa. Friendship Exchange outbound trip to New Orleans April 24 - May 8 has been cancelled. It may be rescheduled for spring of 2020. The inbound team from New Orleans District 6200 to our District 6420 is still being arranged for October 9 - 23, 2019. 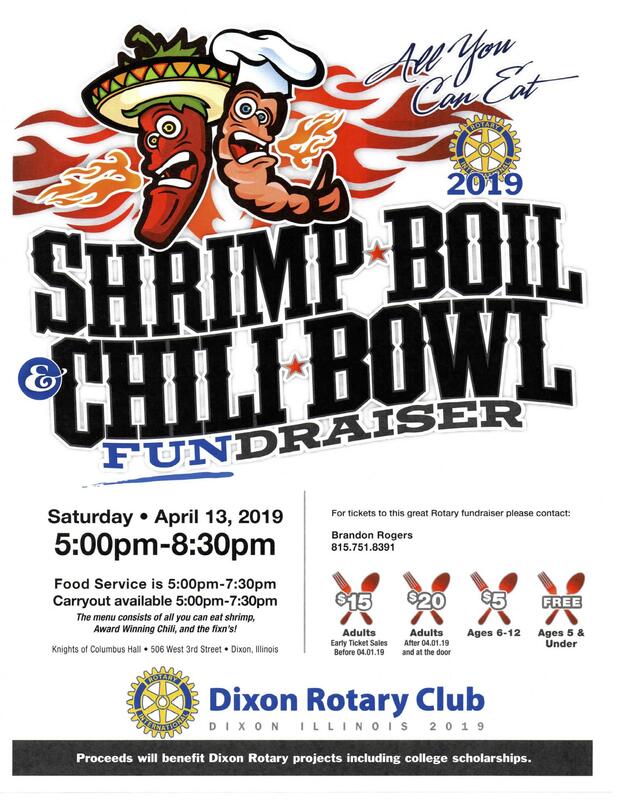 The inbound team from Louisiana will be in the Sterling/Rock Falls/Dixon area first, then in the Ottawa/LaSalle area, and lastly in the Rockford area before traveling to Chicago area to visit Rotary International. As we head into March I am guessing each of you is as anxious to see spring as I am. It has been a trying winter, but there continues to be a lot of wonderful work happening around the district between fundraisers and service projects. Congratulations to all of you for continuing to be the inspiration. March is Water and Sanitation Month in Rotary. We are so fortunate to live in a place where we don’t worry about having clean water. As Rotarians we are very much aware of how many people throughout the world do not have this good fortune. There are some wonderful projects being funded through global grants around the world helping in this effort which is another good reason for contributing to The Rotary Foundation. As we are just a few months away from the end of this Rotary year, we need to be aware of where we are at in reaching our goal in contributing to the Foundation. December is Disease Prevention and Treatment month for Rotary. How appropriate that the individuals who went to India with District 6450 and participated in a National Immunization Day while they were there just got back. Kudos to Chris VanSpeybroeck of East Moline, Bill Bordwell of Geneseo, and Larry Farley of Dixon! I can’t wait to hear all about it. This is such an important area of focus in our organization. I encourage you to go to the RI website and explore some of the wonderful projects being done around the world. Speaking of the RI website, they have redesigned the Learning Center. It is easily accessible and you can learn more about each of the club officer positions. Simply go to rotary.org/learn. This is a great time to be doing on-line shopping instead of being in the craziness of the mall. While you are on-line, you might explore Rotary Global Rewards. This is a great program Rotary offers with deals ranging from discounts to proceeds going back to the Foundation. Amazon is one of the companies offering that option. If you are an Amazon shopper, you can set up your account so that each purchase you make throughout the year benefits The Rotary Foundation. I have had the opportunity to visit our satellite clubs in Galena, Spring Valley, and Oak Crest in DeKalb. I will be visiting the 815 Club this month. Each of these clubs is doing some fantastic things and offer another way for people to be involved in Rotary. You might consider that option in your area. It is a great way to attract those who are unable to attend your regular meeting. The District Conference Committee is actively working to ensure a fun and rewarding conference. Rooms are now open at the De Soto House in Galena for registration. You can call them at 815-777-0090 to reserve your room. Be sure to tell them you are part of the Rotary Conference. I wish each of you a wonderful and peaceful holiday season. Greetings, fellow Rotarians, and a very happy new year! Amazingly enough, we are at the halfway mark of our Rotary year. Every year seems to go just a bit faster, but this year really is flying by. We have accomplished so much thus far and we still have a lot to do before the year ends on June 30. Welcome to the District 6420 Website !